This figure represents a pretty interesting prototype. It's composed of parts made of both proto-molded plastic and hand-cast urethane. 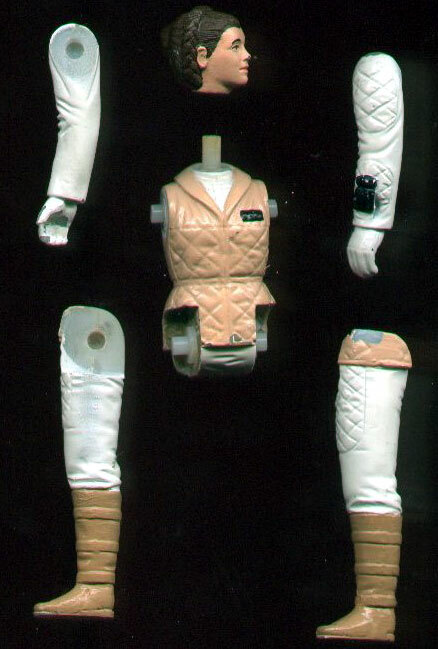 In this shot you can see that the arms are made of whitish plastic, identical to that used to make the items called "internal first shots," "injection-molded samples," or whatever you want to call them. 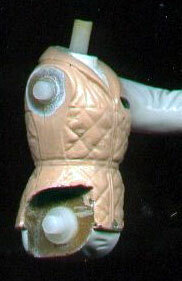 However, as you can see in this shot, the torso piece is composed of the tan-colored urethane that, along with the green dynacast, was typically used at Kenner in the early '80s. I'm not sure what you'd call this piece. But it's function is identical to that of a painted hardcopy. That is, it was used as a photography sample, paint master, or something along those lines.